HAMAMATSU Archives - LABORSCIENCE A.E. Building on our extensive experience with high performance scientific cameras and advanced imaging applications, Hamamatsu introduces the new ORCA-Flash4.0 V3. This one camera expertly handles applications ranging from the acquisition of beautiful scientific images to experiments that demand detection, quantification and speed. 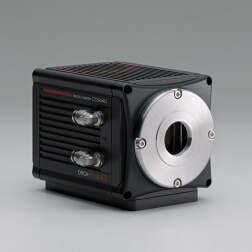 With on-board FPGA processing enabling intelligent data reduction, highly refined in-camera, pixel-level calibrations, increased USB3.0 frame rates, purposeful and innovative triggering capabilities, patented lightsheet read out modes and individual camera noise characterization the ORCA-Flash4.0 V3 is the precision instrument for imaging.